One of my widowed friends recently told me, “I feel guilty being happy alone.” She had been happily married for over forty years and widowed for a few years. My friend explained that she had discovered how comfortable she was as a single woman. To her, being happy without her husband somehow reflected on how she felt about marriage in general, and ultimately cast a negative light on her own marriage. I am certainly not a qualified grief counselor, but as another widow I feel like the fact that my friend found peace as a single woman is perfectly normal. I think it all goes back to the individuality of the grief journey. How and when we find happiness after the loss of a spouse depends on so many factors. In my opinion, just reaching that place of acceptance and recovery is the most important thing. As I pointed out to my friend, in her case, it could be merely a case of phases. She enjoyed each phase of her life–like being married and raising children. And she shouldn’t feel guilty about being okay alone in this phase. I would imagine that the guilt is normal but being happy alone to me does not mean you weren’t happy being part of a couple. It is kind of like looking back at that time in your life when your children were toddlers or teenagers. They were cute and precocious or challenging and every day was an adventure. But after your children grow up, you enjoy a more relaxed place in your life. I would think generally, most people don’t feel guilty about the peace they find after the children are raised. They are grateful for the memories and experiences they had as they embrace and enjoy the changes that come along with adjusting to life without children at home. Of course it is much more difficult after the death of a spouse. In that case, we are suddenly, cruelly thrust into a place where we are forced into change and we have to find a way to adjust. We grow as we journey through life and that makes our expectations for satisfaction different at various points in our lives, too. 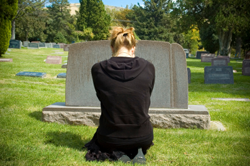 I know after the loss of my husband, I was not the same person I was before he died. So what made me happy after I lost him was totally different than what worked before. Maybe the key is to recognize the fact that it is okay to feel comfortable with yourself and where you are. It doesn’t have anything to do with how happy you were in the past and it certainly doesn’t reflect on the person who made you happy in the past. Life changes and so do we. It is difficult enough to handle the loss of a spouse without having to feel guilty about the fact that your recovery includes being happy alone. You have to do whatever works for you.